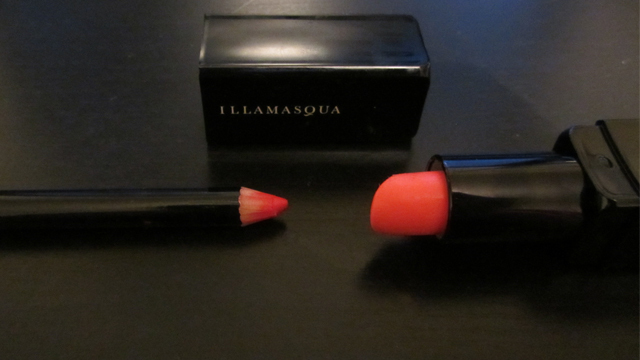 Illamasqua first stood out for me as a brand when I spotted Apocalips, the teal lipstick. TEAL lipstick! This had to be a cool and creative brand! I also noticed that there are a lot of fans out there. Forever in my pursuit of the perfect orange lipstick, following an unsuccessful trip to MAC, I visited the Illamasqua store. It has to be a make-up artist’s dream – the choice of colours made me feel like a child with a paint box, there were inspirational pictures and the staff had uber-creative make-up which made me completely envious of their skills! I like that it is a break from the norm – make-up should be fun! When I re-focused after finding my way to the nail polishes I picked the lipstick in Flare which is the perfect matte orange. It is undoubtedly, unmistakably orange – not red, not coral and not something else. Just what I wanted. There are no orange lip liners so the assistant showed me how I could use it with the colouring pencil in Spell, a hot orange red. I was sold! I have tried them out but didn’t take any proper photos so I’ll re-apply and post my opinion at some point. If you can’t wait, I gave a sneaky peek on Instagram in February and you can check it out here. Checked it on IG..you look great with it!! I totally agree that make-up should fun. If it doesn’t work wipe it off but don’t take it too seriously. Illamasqua is one of those brands I’ve yet to try but it’s on my list.